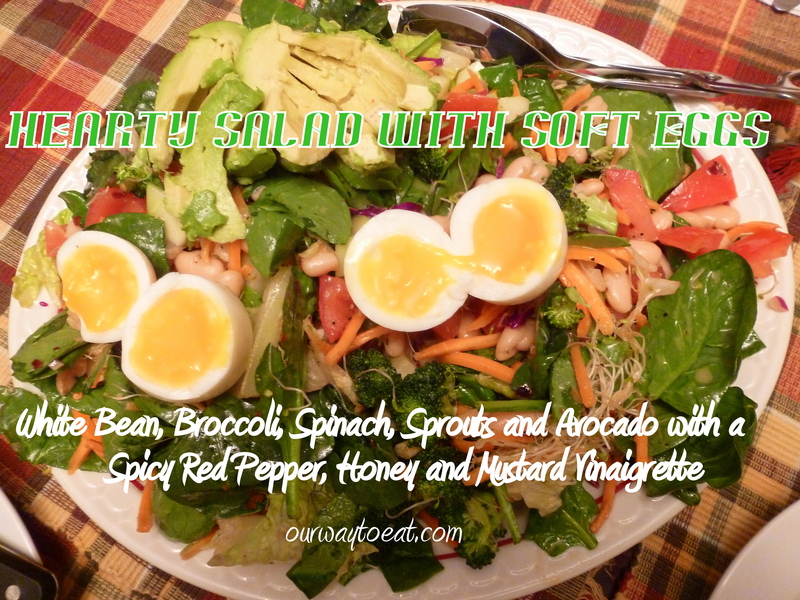 If you are anything like us and you like to eat 3 square meals a day, it tends to be a good idea to throw a salad in the mix once or twice a week. The other night I came home with just such a meal in mind. I started with an inventory of the fridge. I gathered up the remaining vegetables that we had on hand, and along with a few items from the pantry, this is what I put together for our supper tonight. 1 Avocado – peeled and sliced, drizzled with a squeeze of lime juice. 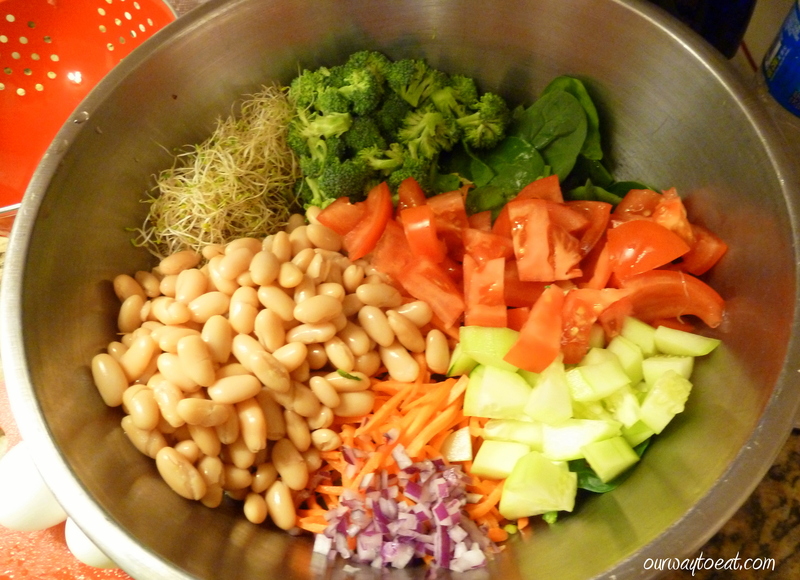 Once I had assembled all of the vegetables I heaped the lettuce and spinach into a medium-sized mixing bowl, began rinsing and chopping the other vegetables, and placed them in the bowl. At the same time, I started a small saucepan of water heating on the stove to cook the eggs. When the water came to a boil, I placed 4 eggs in the sauce pan of water, reduced it to a simmer, and set the timer for 6 minutes. 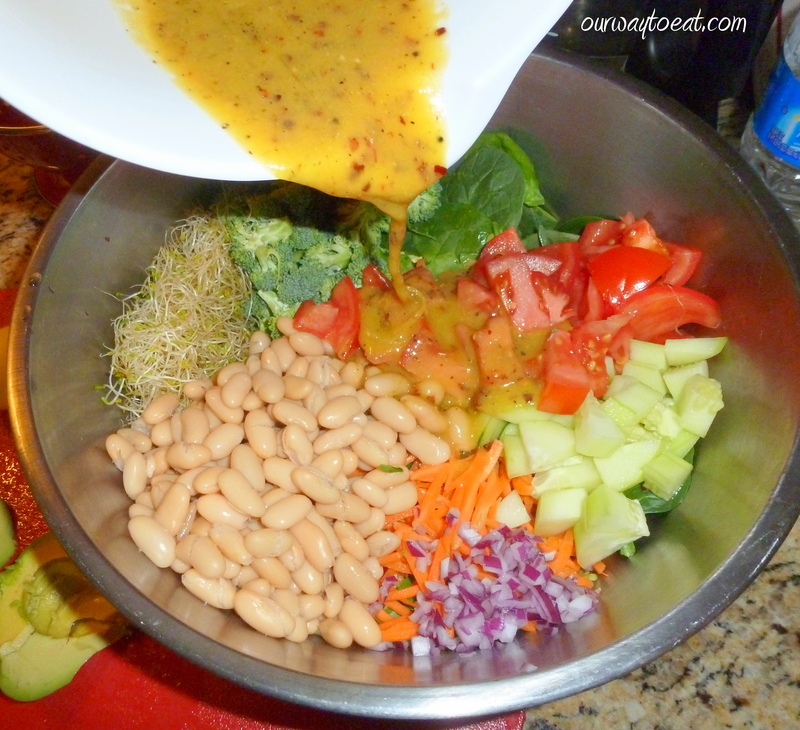 When the bowl seemed to be filled with an ample rainbow of vegetables, I whisked together the ingredients for a spicy and flavorful vinaigrette in a separate bowl. 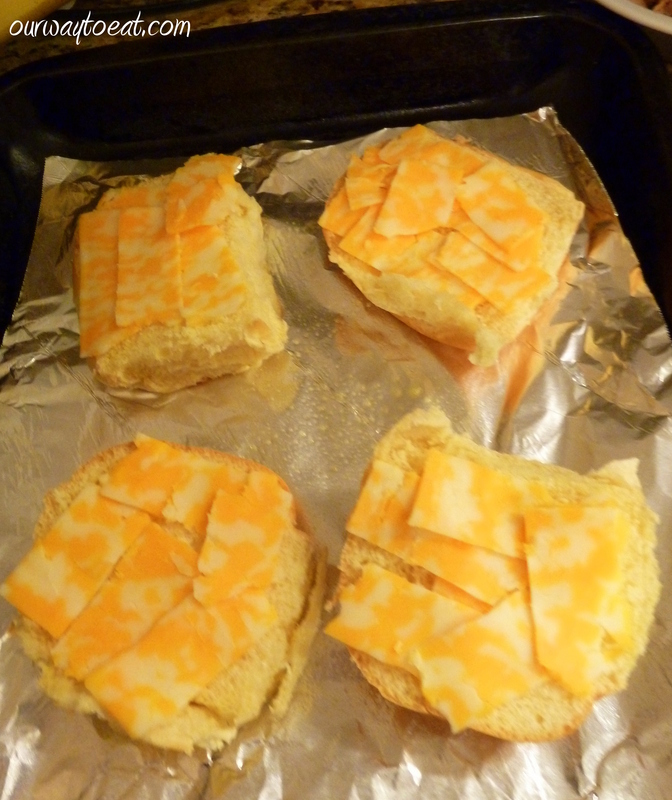 While I worked on the salad dressing, Bjorn split several yellow, eggy buns in half and topped them with thinly sliced, reduced fat Colby-Jack Cheese, and then placed the buns on a foil-lined sheet pan in the oven at 350 degrees for a few minutes to melt the cheese. He also heated a small bowl of leftover spaghetti sauce in the microwave, for dipping the toasted cheese bread. When the eggs had cooked 6 minutes, I removed two for our supper and carefully peeled them. I let the remaining eggs continue to cook a few minutes longer so that they would be hard-boiled, making them easier to pack for our lunches tomorrow. 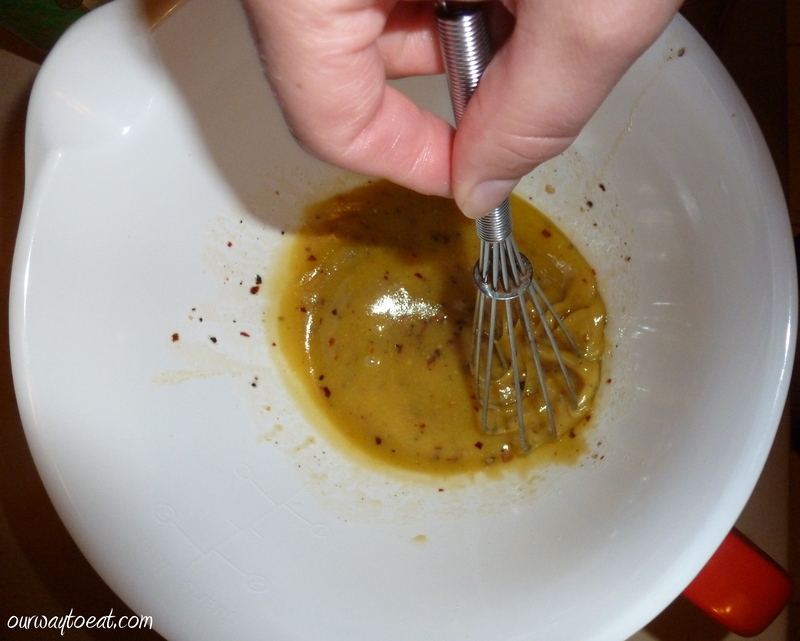 I drizzled the dressing over the bowl of salad, tossed the salad gently with tongs, and served it on a platter. 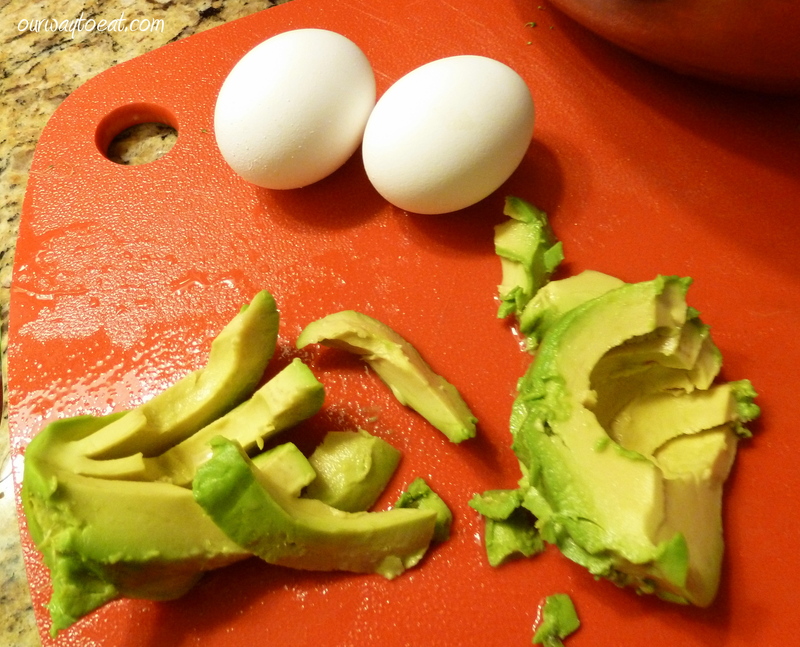 I placed the avocado slices on top, and gently sliced the eggs just before serving to expose the warm, soft yellow yolk. I’m seeing “soft eggs” everywhere, in blogs, such as this tasty-looking and classic presentation on Smitten Kitchen, in magazines and in restaurants on bruschetta, pizza, and salads. Talk about having a classic food item go trendy! I’m all for it though, eggs are a versatile, simple yet exquisite food. Bjorn added about half of a can of tuna to his plate, and mixed it into the salad. 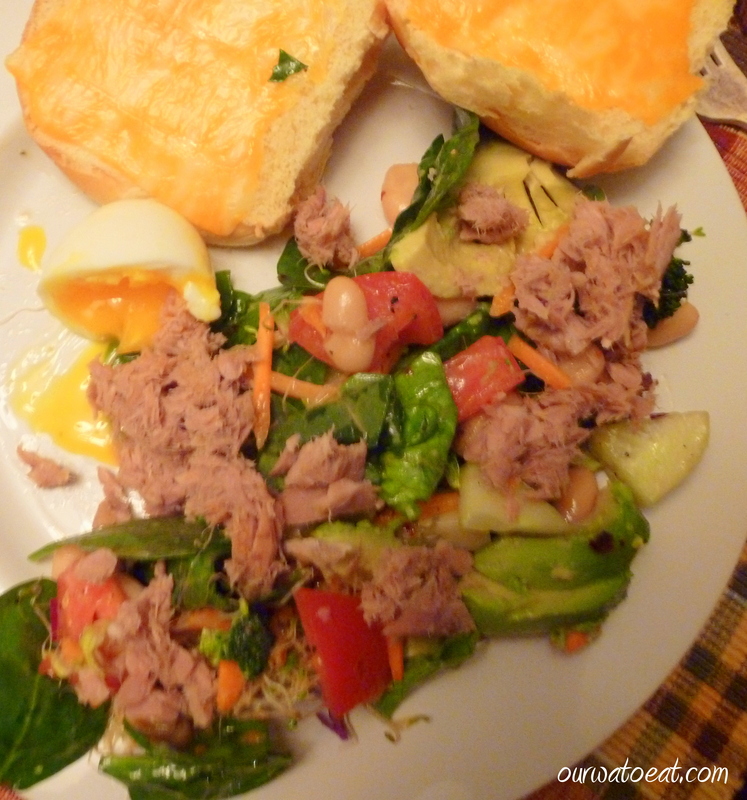 Adding tuna to the omnivore version of this salad added protein and healthy omega 3 fatty acid, a heart-healthy fat. 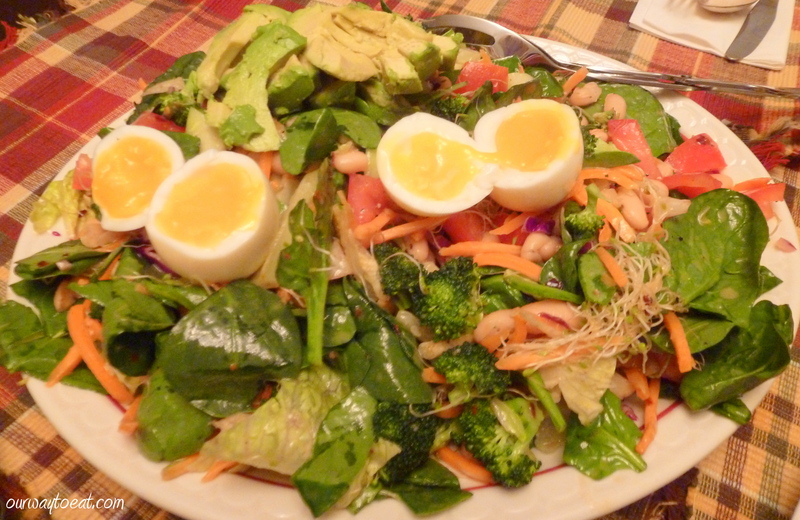 The Avocado and the Extra Virgin Olive Oil in the dressing also added heart healthy fats to both of our plates. The spinach, romaine, sprouts, carrots and broccoli gave the salad a nice crunch and were full of antioxidants, calcium and potassium. 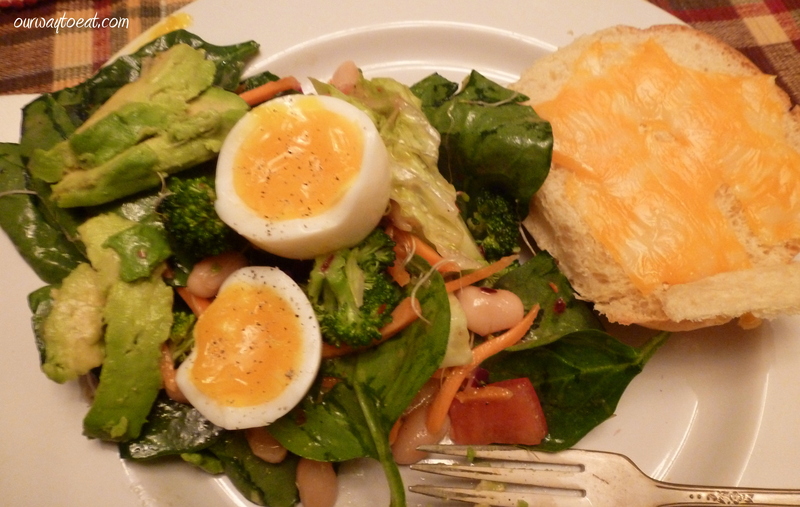 The white beans and egg added a contrasting soft texture to the salad, and protein which made the salad a hearty meal. The vinaigrette had a pleasant kick of dijony, red-pepper heat, and set off the flavors of the soft egg, avocado and red onion. The toasted cheese bread made a yummy side dish dipped in the warm spaghetti sauce. We enjoyed it all. The salad was huge and made plenty for two servings at supper time, two servings for lunch the next day with a little more to spare. 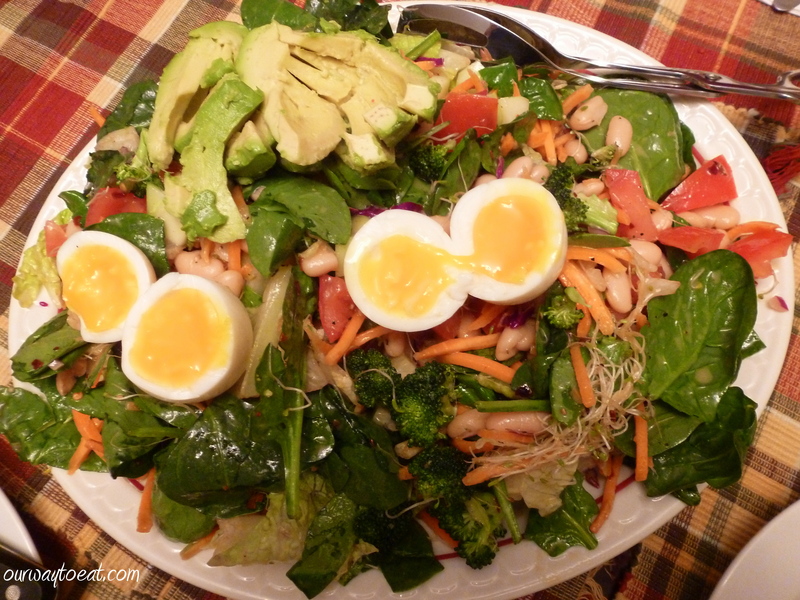 The salad was hearty enough to be a satisfying, complete meal, and had a healthy rainbow of veggies, good sources of protein and healthy fats to make it a nourishing meal, nutritionally speaking. 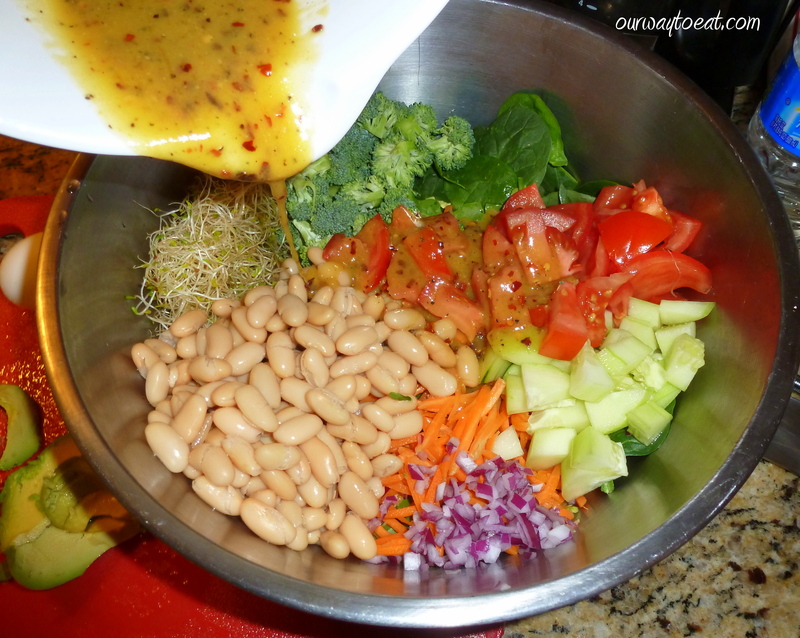 It is wonderful to toss together a variety of vegetables and pantry staples into a salad. It makes for a simple, healthy and satisfying supper that makes you feel good, and that you can feel good about eating. Give it a try!